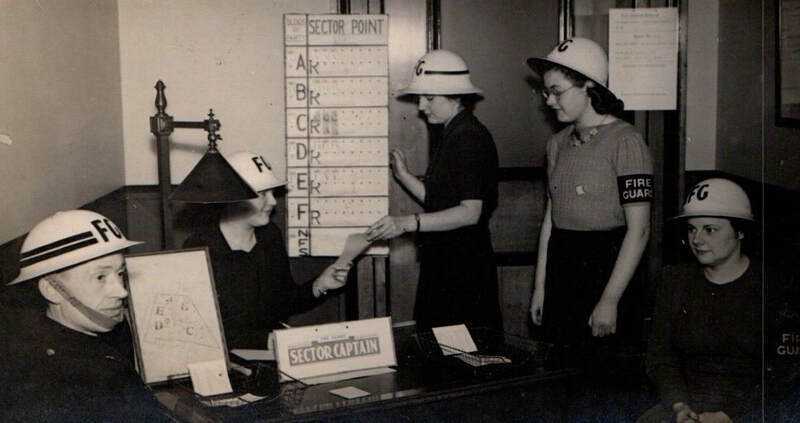 The Fire Watcher Service was formed in September 1940. 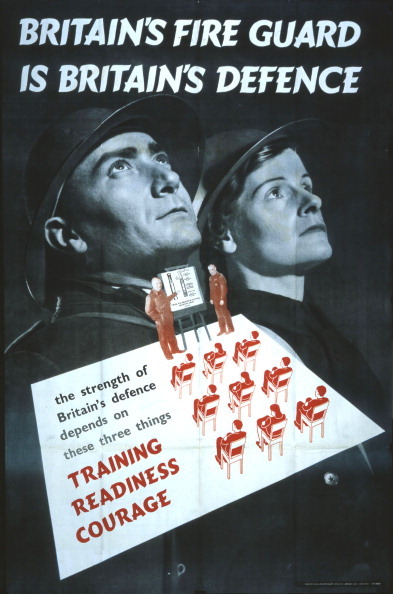 However, following the London blitz on Sunday 29 December, 1940 it was found that many offices and buildings had been left completely unattended. This led to incendiaries causing fires that could have been dealt with if detected sooner. To combat this, in January 1941, a Fire Watchers scheme was instigated. This new decree meant buildings within certain designated areas had to have a fire watcher present 24 hours a day. They were to deal with incendiaries as best they could and call on the assistance of the fire and rescue parties as need be. For some businesses finding cover for their buildings was difficult and so the Government implemented a compulsory scheme of fire watching. Fire Guards, both men (aged 16-30) and women (aged 20-45) could be called up for duty and volunteers were also accepted (men up to age 70 and women to the age of 60). Generally the duties of watching buildings was tedious, with long nights, and proved highly unpopular. Fire Guards did not receive any official uniform but generally wore civilian clothes or a boiler suit. They would be issued with a helmet, armband, torch and a means of dealing with small fires (a stirrup pump) and a scoop for picking up incendiaries and a bucket of sand to put them out. The Firefighters Memorial Trust provide an excllent overview of Fire Watchers and Fire Guards. 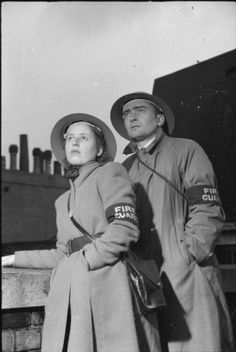 Staged photo of two Fire Guards on duty during second world war. They are wearing the Zuckerman helmet, Fire Guard armband and have civilian respirators gas masks. In the summer of 1940, Supplementary Fire Parties were organised by local fire brigades to assist in dealing with the outbreak of fires caused during air raids (from incendiaries mainly). They wore a dark blue cotton armband with red SFP letters. From August 1940, these armbands were then issued to the Street Fire Parties that were organised by the Wardens service. 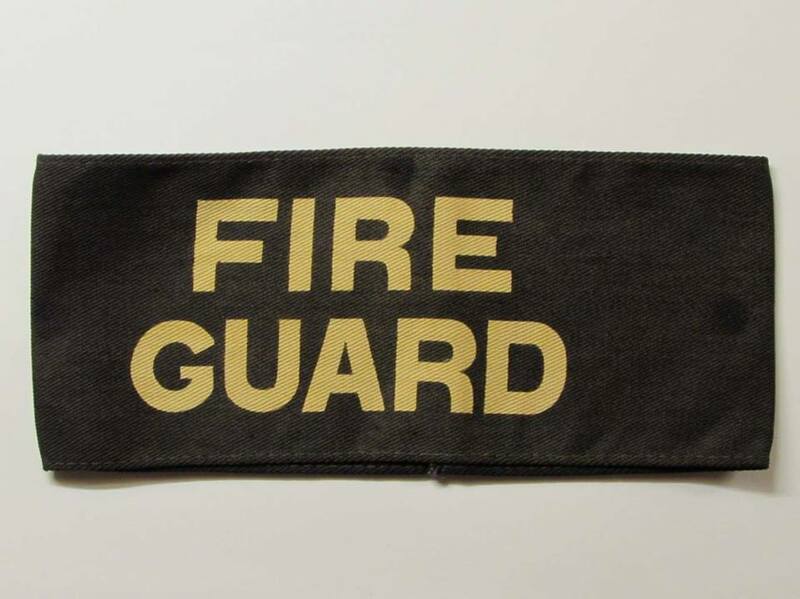 There were also armbands with the word FIRE in red issued. Both Supplementary and Street Fire Parties were reorganised into the Fire Guards. 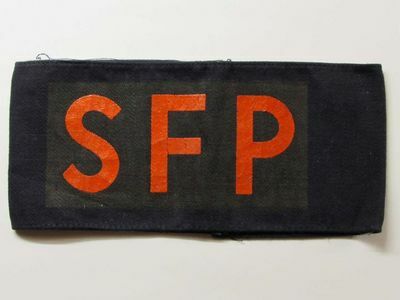 Existing SFP armbands were updated with a Fire Guard patch sewn over the SPF letters. White on blue was introduced during 1943 reorganisation to differentiate itself from the Wardens service. ARP Pattern 39 armlets featured a gold/yellow lettering on dark blue cotton. 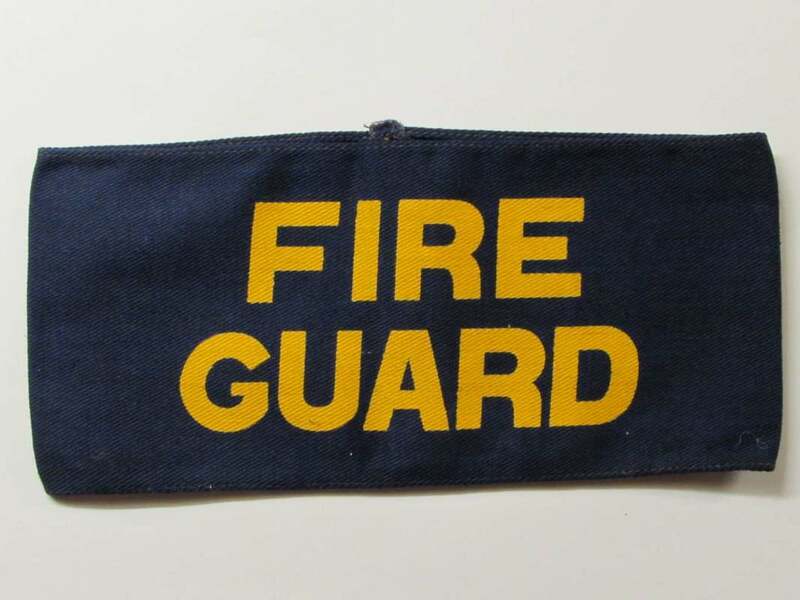 Fire Guard armband - yellow lettering on dark blue cotton. 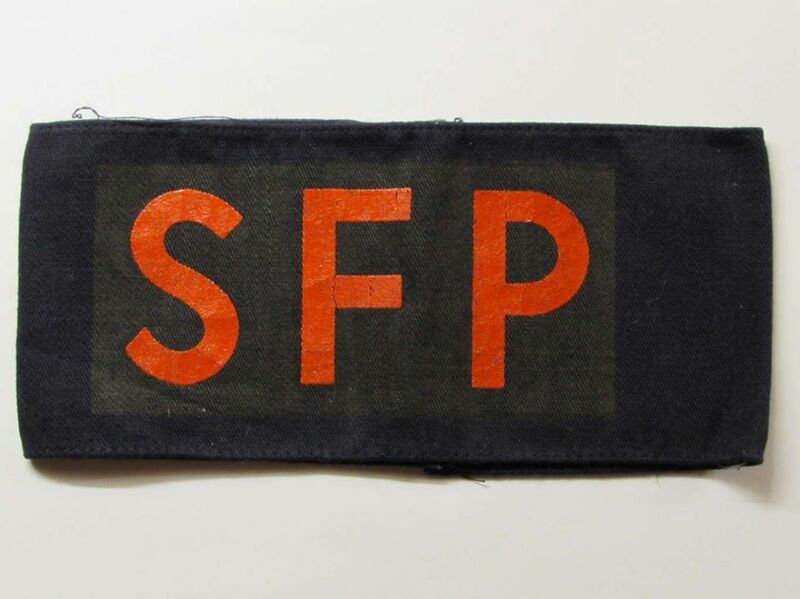 WW2 Fire Guard armband - a patch has been sewn over a SFP armband. WW2 Fire Guard armband - white lettering. 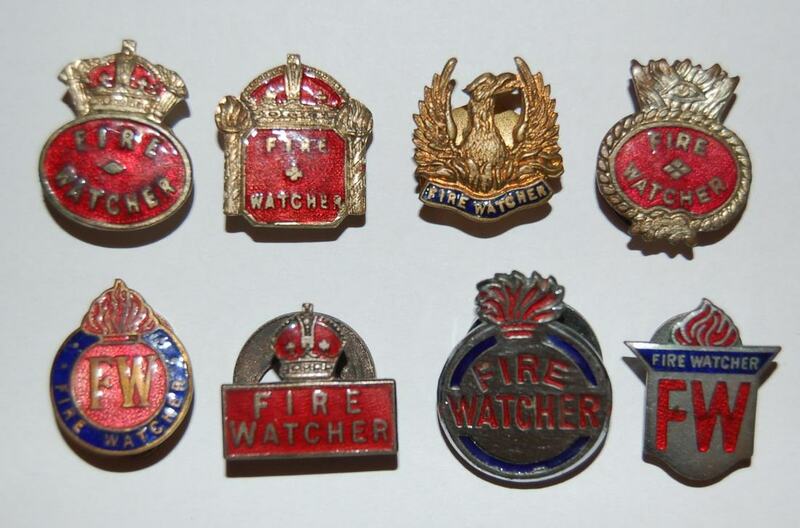 A large variety of Fire Watcher badges were manufactured and issued by companies to people undertaking fire watching duties. WW2 Fire Watcher lapel badges. For information about Fire Guard Instructors' badges see this page. Two Fire Guards wearing the Zuckerman helmet and Fire Guard armlets (IWM). 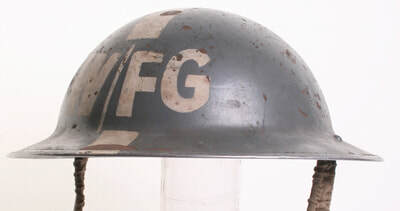 Many Fire Guards were issued with the Zuckerman helmet. This helmet, with a high dome to withstand impact, was relatively cheap to manufacture and used a steel with a lower quality than that in the typical helmet. 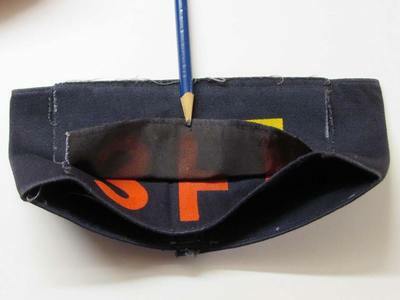 It featured a simple leather lining and was attached with a string through holes in the helmet. 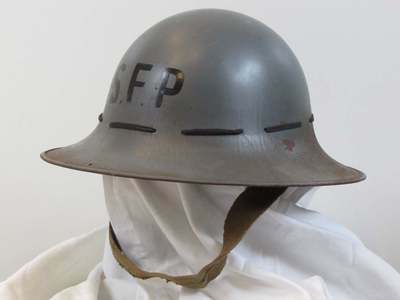 A number of helmets were issued with SFP (Street (or sometime Supplementary) Fire Party) but were replaced with FG from August 1941. However, many examples of SFP continued to be used throughout the rest of the war. Seniority within the Fire Guard service was denoted by black bands around the helmet. There is photographic evidence of some Fire Guard personal with the Mk.II helmet and "W/FG" for "Warden/Fire Guard". 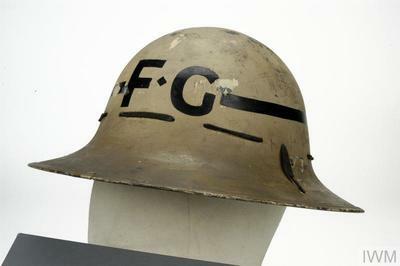 Fire Guard Officer Zuckerman Helmet with single black band. Fire Guard Area Officers (three black ½" bands on white helmet) and SFP fire guards in Zuckerman helmets. 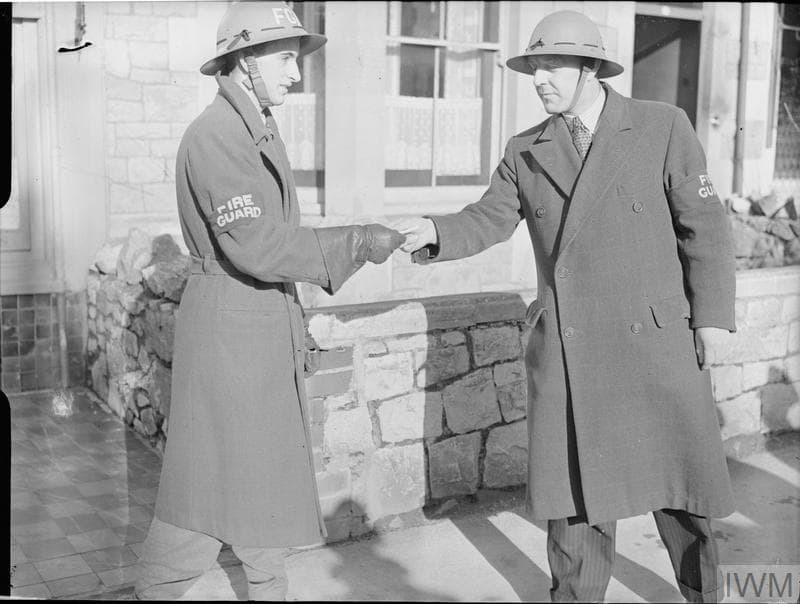 As members of the Wardens Service, all ranking Fire Guard officers (for example Head and Senior Fire Guards) were entitled to wear the same dark blue battledress and trousers seen worn by other Civil Defence services. 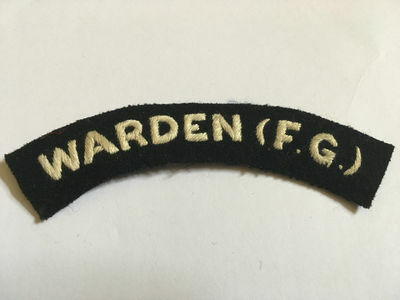 To signify their role within the Fire Guard service distinct insignia was available; these included specific shoulder titles, rank badges (three chevrons for Head Fire Guards, two chevrons for Senior). Printed FG (Fire Guard) insignia often worn below the Warden shoulder titles. Embroidered Warden (F.G.) Fire Guard shoulder title. 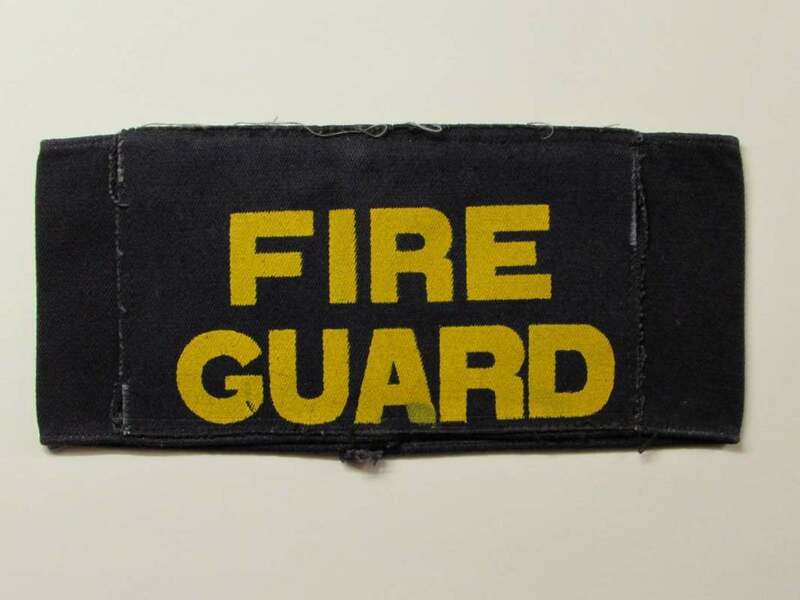 White Fire Guard shoulder title badge. Red Fire Guard shoulder title badge. 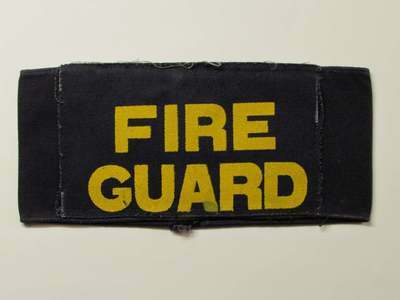 Yellow Fire Guard shoulder title badge. Head Fire Guard shoulder title badge. 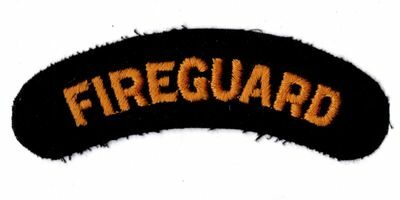 Senior Fire Guard shoulder title badge. 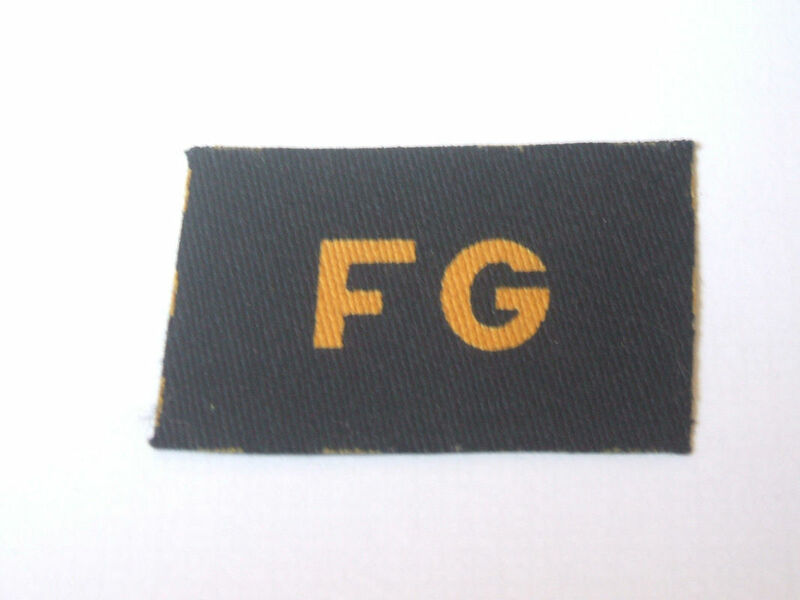 Assistant Fire Guard Officer Shoulder Title. Area Fire Guard Officer Shoulder Title. Fire Guard Sector Captain badge. 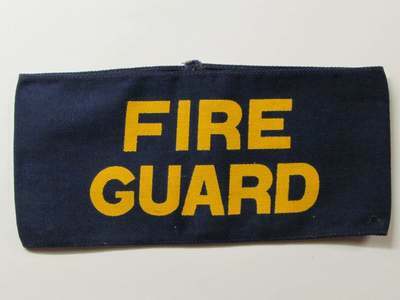 Sector Captain (Fire Guard) Shoulder Title. Fire Guard Sector Captain and assistants.